Western society generally places greater value on the individual over the group by expecting individuals to make fast and high-quality decisions with group-based decisions regarded as much less important. However, this idea is often challenged, as we are more likely to be involved with others in our decision making than ever before. After all, ‘two heads are better than one’, inferring that three heads can therefore be better than two, and so on. Researchers have added to this idea suggesting that groups make more innovative decisions due to diversity of membership and the related advantages of difference ‘creative tension’. But there are challenges with research also sighting the group- based phenomena of: ‘groupthink’, or group-based information processing biases; overly directive leadership and errors in communication exchanges as potential short group related shortcomings. Being aware of these deficiencies in group-based functioning and working to overcome these flaws in groups’ information processing and decision making are very much the prerequisite of the innovative, smart thinking, effective group member, and will form the focus of Assessment 2. You are one member of a three (3) person team of line managers to form a panel with the task of business cost containment in an organisation of 300 people. The importance and urgency of your panel’s work relates to the business having recently lost two key products from their product line. Both products have been lost to the market through changes to government policy and falling business profitability need to be reversed quickly. The business has concluded that it needs to quickly reduce its wage-salary costs to survive into the next period. Executive anagement has decided to set up a panel to advise on ways of quickly reducing wage and salary costs through a reduction in staff numbers as a means of positively addressing problems with the business’s current P&L statement. Your team is tasked to analyse a data set provided and come up with a listing of people you are recommending for redundancy. Your team is to select from a list of sixty people and make recommendations on the type and number of people to be made redundant. Executive management has not stated the exact number of people they want removed from positions but any meaningful reduction in costs for the business would need your panel to recommend at least sixty percent (60%) of those listed being made redundant. numbers of people to be made redundant. Try to identify differences in decision style and personality between team members in advance of forming up the team (HINT: look back at your assignment one’s treatment of decision preferences and your MBTI results). Make yourself aware of established theories, accepted practices relating to group dynamics and group processes. Identify any malfunctioning team behaviour and biases. Consider the challenges of working in virtual teams and identify ways in which your team can best communicate making fast, good quality group-based decisions. Take account of team members’ individual differences in decision preferences, personalities, styles and difficulties and practical challenges in gaining access to one another when establishing your Team Rules. reaching decisions; agreeing on and writing up and summarising the team’s conclusions, recommendations and justifications. Working with your fellow team members and the data provided, identify the number of people to be made redundant, select and list those people and outline your panel’s justifications for WHY they are being recommended for redundancy. Include an outline of the process of data analysis –decision making used by the team in selecting and recommending people for redundancy together with a summary of the team’s redundancy decisions, recommendations and associated justifications. 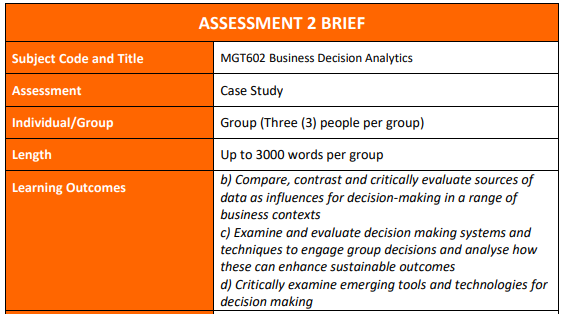 Your group must prepare a Case Study style report which should take the following form and use the headings provided. The team’s recommendations and justifications to management can then follow on from these processes of analysis. You may make any necessary assumptions you deem necessary; however, any significant assumptions should be detailed in your report. Teamwork and group participation will constitute 15% of the mark for the assignment for each member of the group. o Each group is to submit one final Case Study submission into Assessment 2 submission link in the Assessment section found in the main navigation menu of the subject Blackboard site. A rubric will be attached to the assessment. Assessment 2 review submission link. 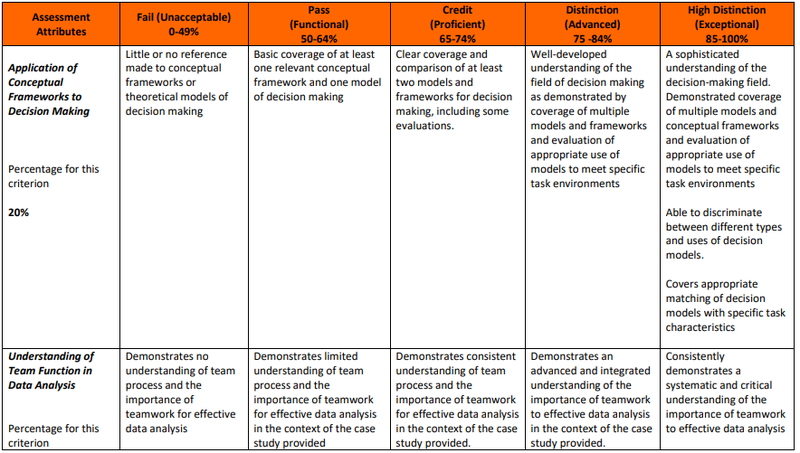 a) Individually, each team member will assign a “teamwork” score (from 1-5) To SELF and To OTHER members of the team/group using a participation score matrix attached to the marking rubric. c) The score matrix and personal reflection will be individually submitted to the Facilitator at the same time as the group (collective) report submission. d) The Facilitator will use the average “teamwork” score for each member in considering the weighted teamwork or group participation contribution to their final mark. Get BUS101 Business Analytics Assignment written by professionals.